Avocado Oil is a HIT! 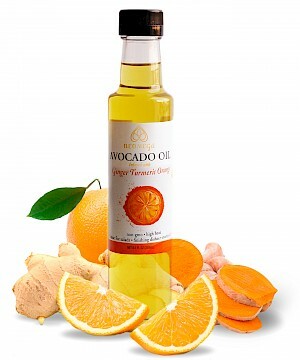 I am a fan of avocado oil and this one, infused with ginger, turmeric and orange is very interesting. The aroma and flavor is very orange and could overpower. I tried it plain and on a salad. On the salad it brought the lettuces to life and had a great taste. I'm leery of cooking with it although avocado does work well in high heat cooking. I could see cooking fish - but not sure what else. The label promotes the health aspects of turmeric and ginger but I'm not sure that the amount contained will actually offer any health benefits. It's a good addition to a culinarian's cupboard. One tablespoon is 120 calories, 14 grams of fat, no sugars, sodium or protein.